Thankfully, parents are no longer trusting that agencies and industries are working in our best interest. Informed parents are taking the initiative to seek natural, safe ways to restore health and well being for themselves and their children. Tired of the dying paradigm—suppressing symptoms with drugs and surgery—today’s parents want solution-based wellness care that is safe and effective. Today is fortunately the age of information; we are privy to knowledge previously kept from the public. The Internet has allowed us to explore and research information on our own— as opposed to being misled by persuasive advertisements on TV. We are challenging the legitimacy of the entire system as numerous drugs and procedures “proven safe and effective” are turning out to be not-so-effective and—even worse—unsafe. “Evidenced-based” research and any practice based on it no longer carries authority because the foundation of its integrity is in question. Rather than relying on industries that substantiate their own products/interests through biased trials, parents are embracing care that offers their families true results with improved quality of life. 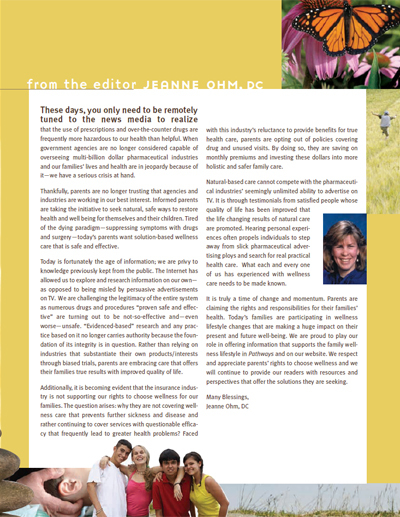 This article appeared in Pathways to Family Wellness magazine, Issue #11.